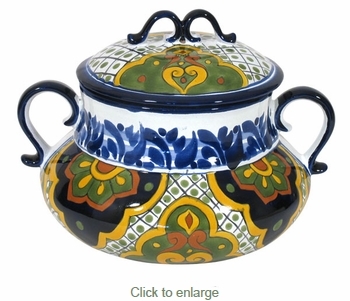 This traditional Mexican Talavera soup tureen is sure to be a colorful addition to your serving collection. Perfect for serving tortilla soup, chile or your favorite soup recipe. Handmade and hand painted by Mexico's talented potters, all of our Mexican Talavera dishes and serving pieces are dishwasher and oven safe.